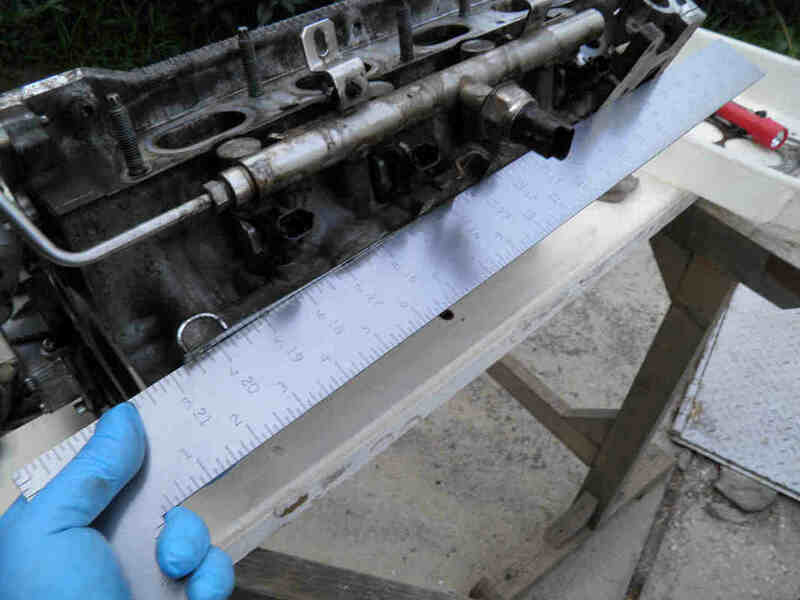 Use a thick metal ruler to make sure the cylinder head is not excessively distorted. 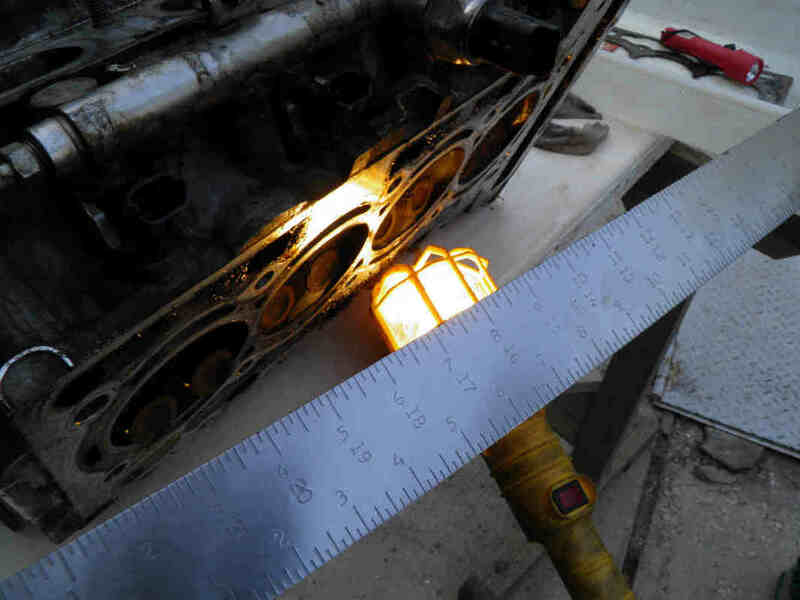 Try it while the cylinder head is vertical and horizontal having light behind the ruler. 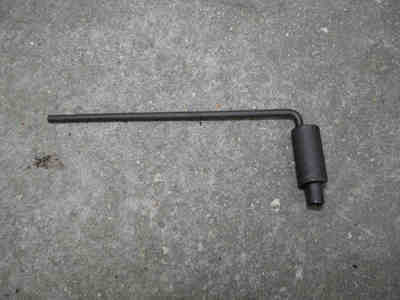 If needed, use an inspection lamp behind the ruler. 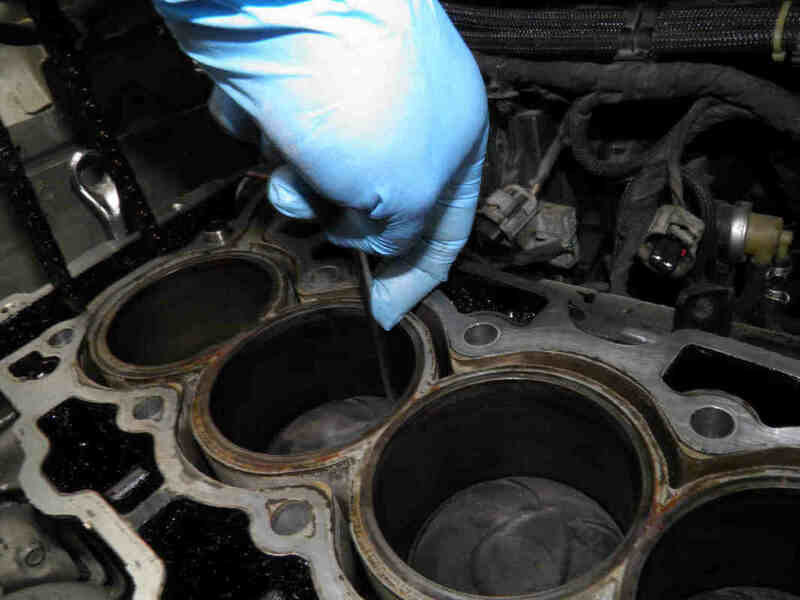 Injectors tips are clean and along with the valves, they all have the same appearance in all cylinders. 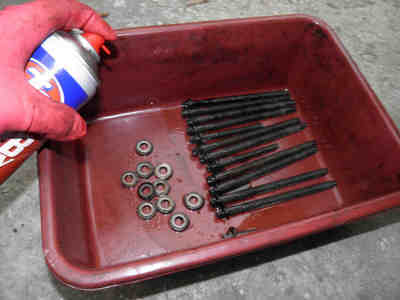 Brushing with a rigid plastic brush the camshafts, hydraulic lifters, etc. 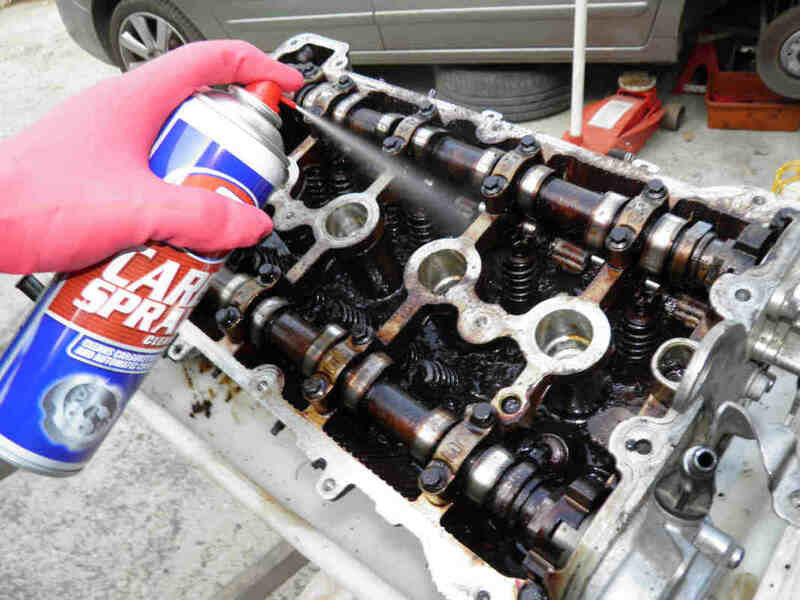 to remove partially carbonized engine oil. See our page for cylinder head sludge removal for more details. 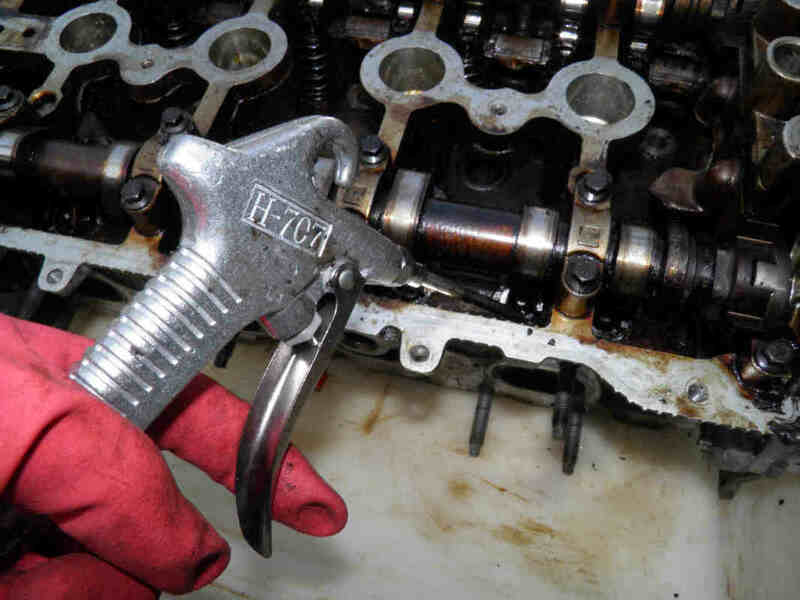 Cleaning the hydraulic valve lifters with carb spray. Later, and after refitting the cylinder head, new engine oil will be poured over the lifters. 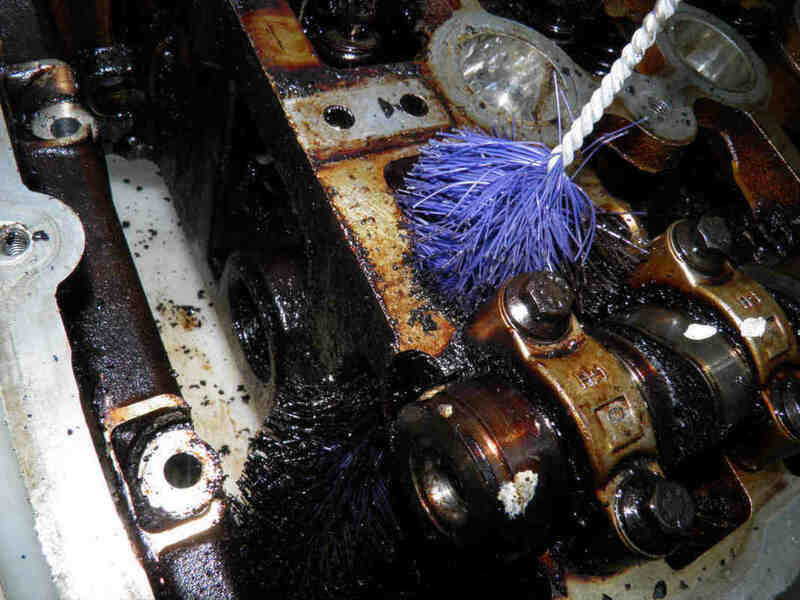 Blow with compressed air whatever particles that are left after the cleaning operation. 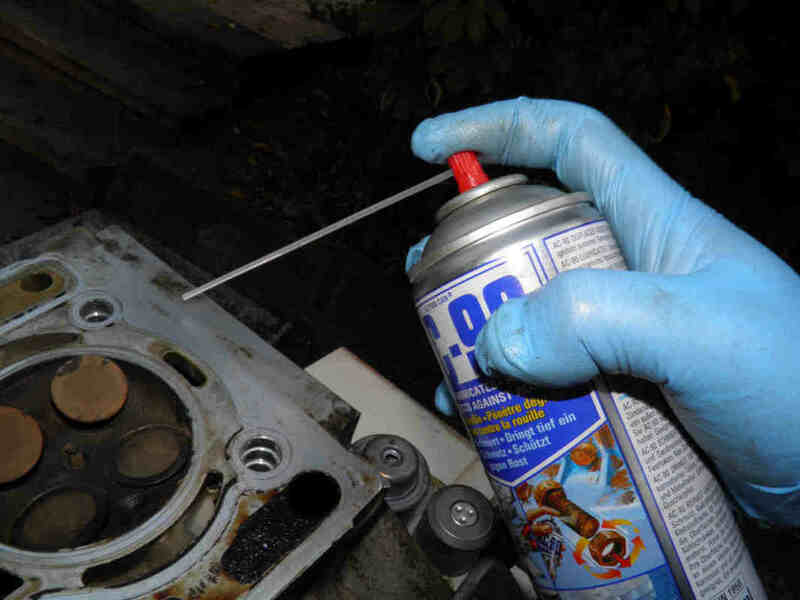 Complete the cylinder head cleaning by using WD-40 or equivalent to clean the cylinder head surface where the head gasket will be in contact. 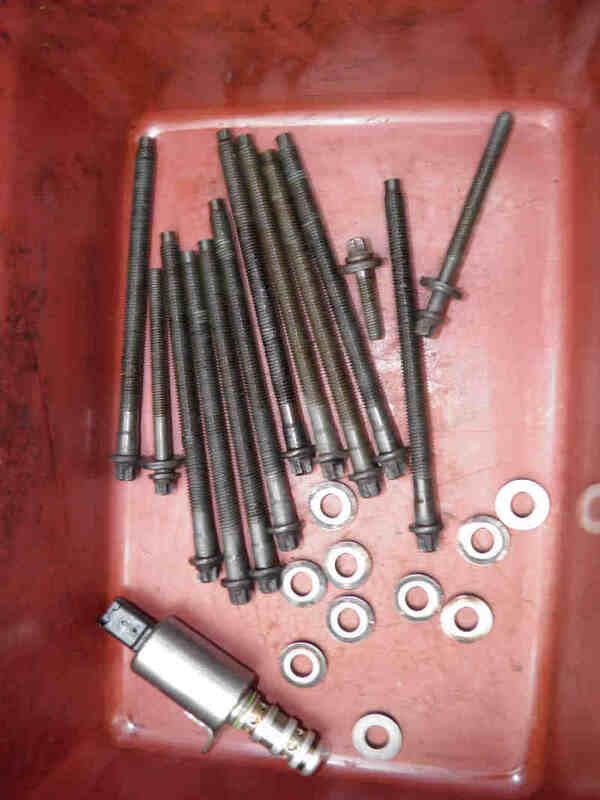 You should replace your cylinder head bolts. If you do not find new bolts, thoroughly clean with carb spray the bolts, washers and nuts and apply a thick coat of high temperature grease to the whole the threaded part of the bolt. 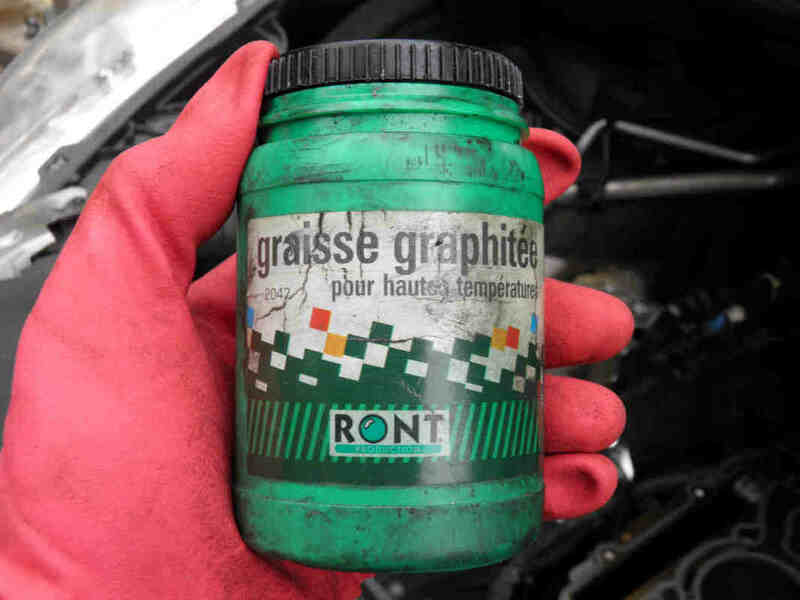 Grease with graphite contents are well suited for the job and widely available. use only P1000 (one thousand) or higher grit sand paper, NEVER LESS. 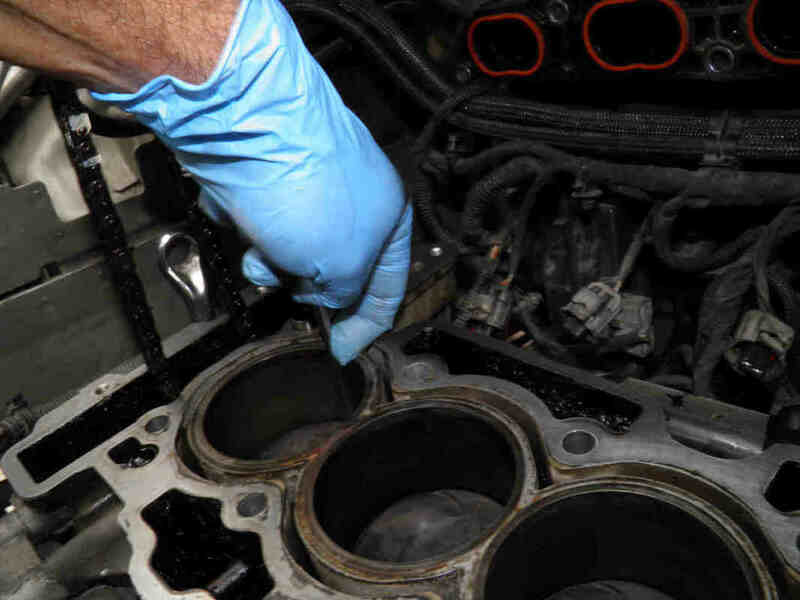 inspect the cylinder liners tops to make sure all are aligned with the engine block body. 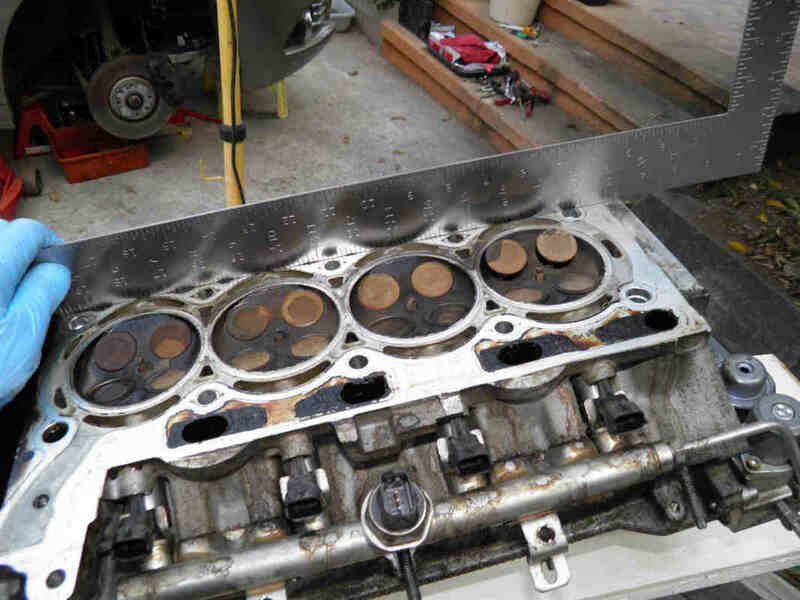 Use a metallic ruler like for he cylinder head. Turn the engine by hand clockwise using a combination spanner on the crank pulley bolt (left) and while making sure the timing belt is attached to the hood. With any stick like an Allen key make sure to bring your pistons to mid-travel by measuring the height to surface of 2 adjacent cylinders like 4 and 3 as shown here. 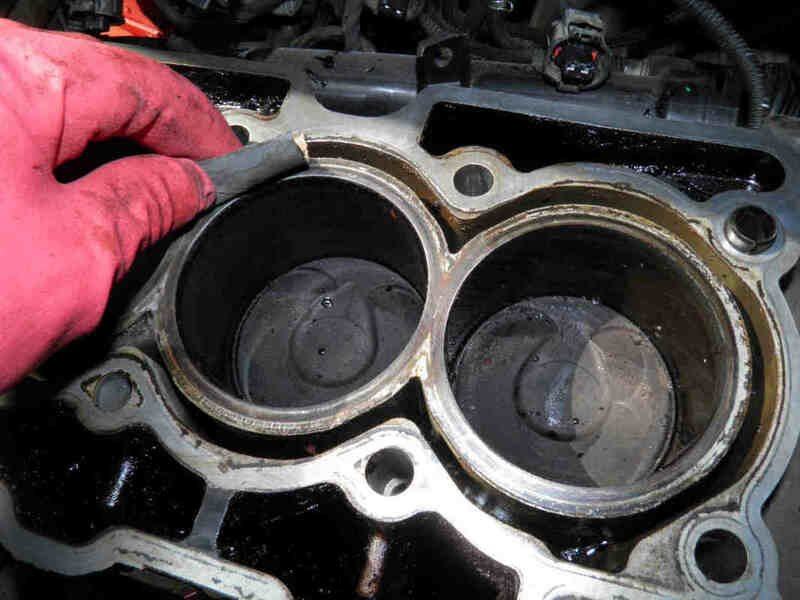 Mid-travel occurs twice at every engine turn, you should do so with pistons 1 and 4 moving up. 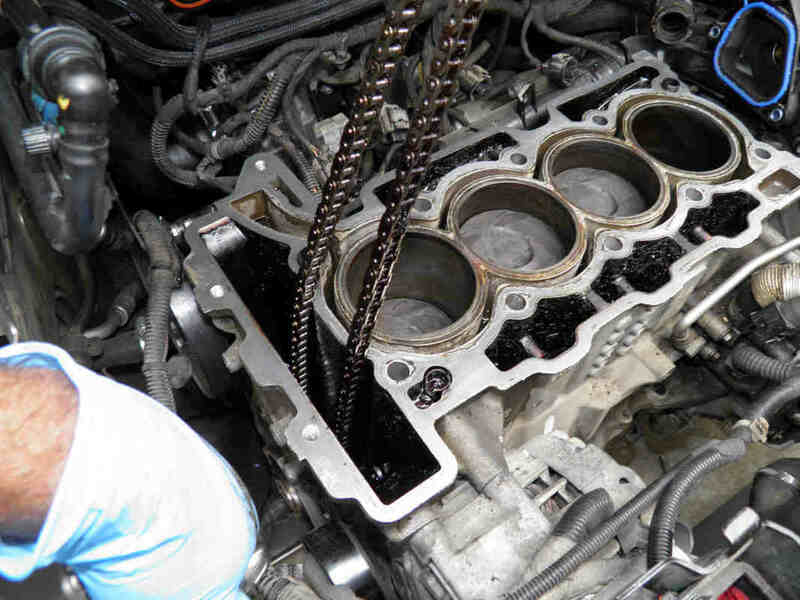 Never turn the engine anti-clockwise during this operation. Turn it gain clockwise by a complete turn if you pass the mid-travel position. In order to facilitate the positioning of the engine peg, make sure your mid-travel alignment is quite accurate using calipers. Now fit the EP6 engine peg (left) into its place located between the exhaust and flywheel. 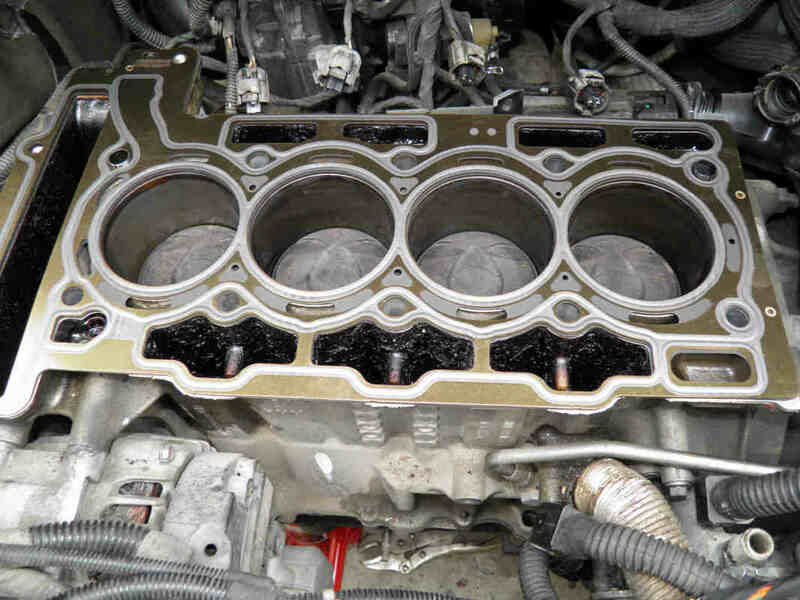 DO NOT FORCE IT into its seat especially this depends on how accurate you were able to put the pistons at mid-travel. 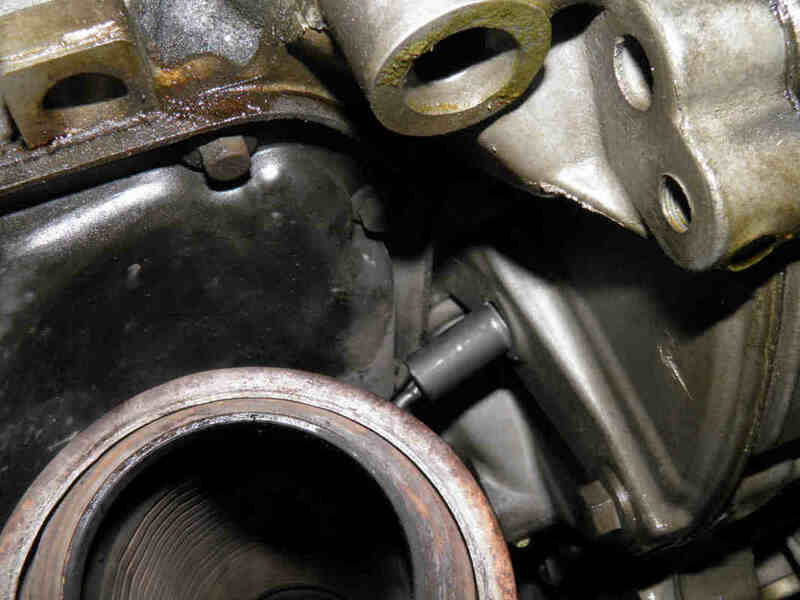 If the peg hole is passed (even slightly by a fraction of a millimeter, turn the engine again clockwise and repeat your attempt. Do not turn the engine anti-clockwise at all.